Recently I was asked by our senior management team to provide some examples of governance and architecture gone bad. As with most IT projects, the technology isnt really the problem (unless your one of these companies) – its the polictics within the organization – not to underplay technology complexity. My examples have a key theme – Centralized control over IT is critical to building an environment that provides the services required by users as well as being manageable and sustainable long term. Scenario One – US School District – When a School District allowed the schools to be autonomous entities they no longer followed formal purchasing guidelines and began building their own islands of IT. Today, the school district is pressured by reduced budgets, having to build managed services for the schools – the overall goal of providing children with the best learning environment possible. Not having IT architecture and governance has placed the district and schools in contention with each other and has cost the district millions in duplication of IT and staffing. The long road ahead will recentralize IT and its related functions and consolidate services and build a shared environment all schools can leverage – in a more cost effective manner. Scenario Two – US Entertainment Company – An entertainment company has allowed the business units to manage their IT as autonomous units. To complicate things further, the company heavily leverages consultants (All looking for the next contract and protecting their interests) and allows them to drive key IT initiatives. Also, the company has entered into an outsourcing agreement with a large IT company and has lost many key staff. Today, the client wants to deploy Portal technology to provide for collaboration, knowledge mgmt, communities of practice etc…the overall goals of staff efficiency improvements and reduced costs associated with cost of ownership. 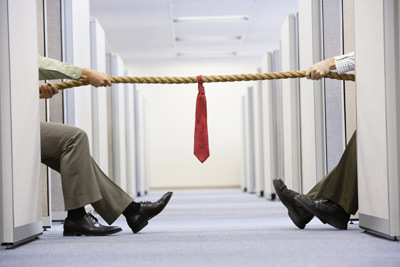 The challenge the company has is the employee/contractor conflicting agendas, significant mix of technologies and over complexity of integration that has lead to an IT architecture whereby staff doesn’t understand the components and what they do, agility and maneuverability have been greatly hampered due to a spaghetti like integration mechanism. Going forward, the company must create a rigid governance structure, bring the LOBs back into the fold, find and deal with contractors that have rogue agendas and simplify IT so they can deploy services that enable the companies vision. Scenario Three – US financial services organization has a siloed operating structure and missing key groups such as product management, the groups distrust each other, communication is strained and in some cases nonexistant. Managing large Microsoft environment nobody was paying attention to capacity needs such as storage, servers and network. No Governance resulted in capacity issues, outages etc. that impacted the business often. Managers blamed other managers and their staff, staff avoided the situation and blamed management. The problem? Executive team didn’t know how two align groups nor structure them, management team didn’t understand governance, product management team didn’t understand roadmapping and product management, engineering and architecture teams had given up tired of being the scape goats. As with the other scenarios proper governance with aggressive communications, escalation mechanisms and very senior sponsorship is required. Also, some management changes and organizational restructuring as well. Have a scenario you would like to share? Contact me.